Something A Little Bit Different for Hungry Feral Kids. | Life Love and Hiccups: Something A Little Bit Different for Hungry Feral Kids. Something A Little Bit Different for Hungry Feral Kids. This is a sponsored post for the Australian Mushroom Growers. So Schools back and in our house that means that normal chaotic programming has resumed. I'm back at work, the hubby is back at work, lunches need to be made, uniforms ironed, sports and after school activities have resumed and homework...Oh man homework is back on the daily agenda. Kill me now! I don't know about you guys but it is week 2 of back to school and I am already over the whole Yay the kids have gone back song and dance and I am almost ready to start the countdown to school holidays again. OK maybe not quite yet, but I am a little overwhelmed by the ferocity in which routine has returned to our household. There is no easing into it is there. If routine and I were to have a conversation it would most likely go something like this "Hello there - we meet again, shall I kick you in the stomach and belt the breath out of you or would you prefer a good arse kicking to remind you I am back in your life?" Hmmmm gentle re-acquaintance .... NOT! For me the hardest part actually takes place after school. The kids rush off to their sports, and when they get home they are starving, tired and completely uncooperative. Lets not even start on the reception I get when I bring the homework books out. We are all tired from work and school and quite frankly I cannot be stuffed with any fuss and nonsense. They are hungry and want dinner. I'm thirsty and want them to go to bed already. Why are weekday dinners in our house nothing like they show on TV with all the happy smiley families sitting around laughing at each others stories of their day. We could have that in our house too if we wanted... but I'm not entirely sure sedating the children is legal in this country. Again I kid ... but I'd be lying if I said the thought had never crossed my mind at least once. The longer it takes to get dinner organised the higher the chance that world war 3 will erupt between at least two of the kids. The only thing that can salvage any remnants of a peaceful evening is a quick and easy dinner. I want to enjoy the last month of summer evenings, eating outside, eating fresh and damn it I want to be that happy smiling family chowing down on their meals in the TV commercials. We tend to opt for quick and easy meals. Something not too heavy, something everyone will happily eat with minimal fuss and something that results in leftovers that can be packed in lunchboxes the next day. BONUS! Since we are all basically vegos in this household (excluding the poor deprived hubby who craves meat), we eat a lot of mushrooms. We put them in pretty much everything because they give us that meaty taste that we no longer get courtesy of red meat allergies. Did you know that mushrooms have all the attributes of a superfood? They are rich in nutrients and flavour. They're affordable, easy to get and best of all in my books they are low in kilojoules which is good news for my already ample backside. Now I am not the most patient cook at the best of times and during the week my patience completely disappears out the window, so something that is easy to make, tasty and a little bit different totally floats my boat. 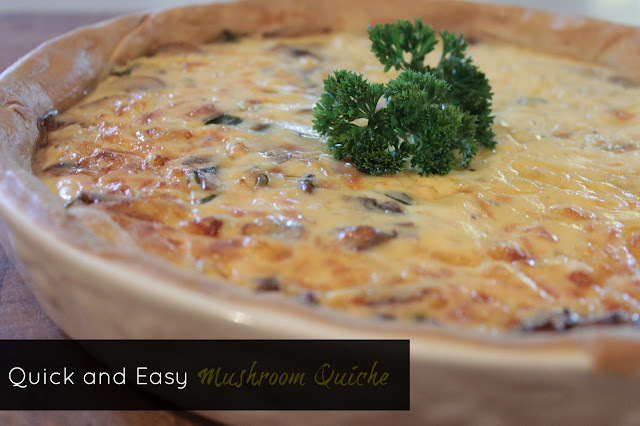 This is my recipe for a Quick and Easy Mushroom Quiche. Before you dismiss this as something your kids wont eat, hear me out. My youngest son (age 5) is pretty darn picky when it comes to food but seriously he hoovers this and then asks for more. No bull! This quiche is also perfect to make then pack to take with you for a summer evening (aka let's get the kids out of the house before they harm each other) family picnic dinner. Don't you love those! Butter the bottom and the sides of a 20 -25cm pie dish. 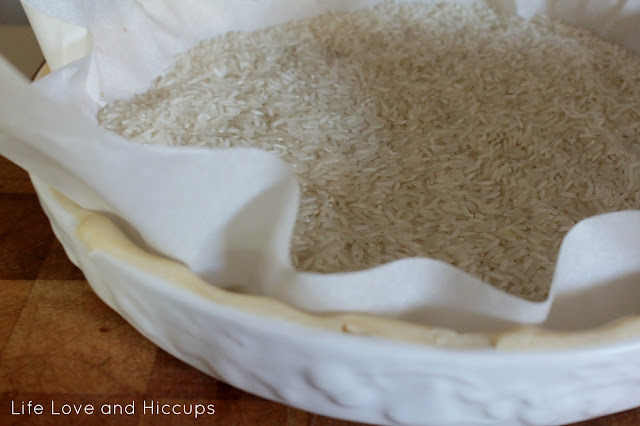 Line your pie dish with pastry and cover with baking paper using marbles or rice to weigh it down. Blind bake for 15 minutes and then set aside. In a frypan, gently cook your mushrooms, shallot and butter over a medium heat until soft and tender then set aside. In a mixing bowl whisk your eggs, cream cheese, tasty cheese and salt and pepper together. Layer your mushroom mix in the bottom of your pie dish then cover with your egg mix. Bake for 25 minutes at 180 C until set and then you can garnish it with parsley before serving. We served our quiche with a simple mixed leave salad and shaved Parmesan We dressed it with olive oil and white balsamic vinegar and sea salt. For more facts on the health and nutritional benefits of Mushrooms or for some great mushroom recipes and info, visit the Power Of Mushrooms Website here. What other quick and easy meals do you like to make to survive the school night madness? Are you mushroom luverrrs in your house too?